You know that feeling when you cross the last to-do off of your list, look up at the clock, and realize there are still a few hours left in the day? Well, that’s a really good feeling. And it’s a feeling that is familiar to content creators who have a clear understanding of their goals and the steps they need to take to achieve them. One simple way for creators to do more with less is by taking advantage of audio transcription. By the way, a transcript is a written record of a video or audio recording. If you’re recording audio for any reason, whether it’s team meetings, customer interviews, sales calls, or webinars, there are five really good reasons to transcribe that audio to text. Accessibility–If the goal is to reach a larger audience, don’t overlook the 35 million people in the U.S. alone who depend on transcripts to enjoy recorded content. Discoverability (SEO)–Transcription makes audio searchable and helps more people discover your content through search. And who doesn’t want to rank better in search? Repurpose content–A recording is but a seed for other forms of content to spring from. Think about turning that podcast into tweetable quotes, an infographic, or even expanding it into a comprehensive guide. Increase shares–As more people find your content, it follows that more people will share it, too. Make it easy for your fans to share your insights with others. Delight your audience–By offering more than one way to consume your content, your readers can opt to listen on a run or read at their desk. The point is, it’s up to them and your content is available both ways. In the past decade, the amount of recorded content has skyrocketed. Between Audible’s growing selection of audiobooks and iTunes expanding library of podcasts, we’re never caught not listening to something. And there’s truly something for everyone. More so than ever, you are the DJ of your own commute; don’t let anyone else touch that dial. You have to admit, there are moments when it’s nice to have the option to read rather than listen to a podcast. Those are the moments that transcripts come into play. If you’re not convinced, here are some common instances when a person might opt to read rather than listen to a podcast: If they are hard of hearing. When they know they won’t have a great WiFi connection. While at work. When rocking a baby to sleep. When headphones aren’t available. And the list goes on. The point here is, if you’re only producing audio content, you are probably missing out on a big potential audience. In addition to those who simply prefer to read rather than listen, there are 35 million people with hearing disabilities in the U.S. alone. That means that a large chunk of the population depends on transcripts to consume and understand the content you create. If your goal is to reach a bigger audience (and isn’t that always the goal? ), then why would you skip a simple post-production step that helps your content reach more people? The simple answer is, you wouldn’t. When someone takes the time to include text transcripts of the audio they produce, they are telling their listeners that everyone in their audience is important. It’s an easy step that communicates to your listeners, “I care about your needs and published this recording with you in mind”. Transcription makes audio searchable and helps more people discover your content via organic search. If audio is transcribed, Google bots can read the transcriptions and know exactly what content is contained within the recording. On the other hand, it’s not possible for Google to crawl the contents of podcasts, radio segments, recorded interviews or webinars if there is no transcript to support the recording. In order to make your recording appear in search, you have to transcribe audio to text. Doing this will help surface your content to audiences that might not have discovered it otherwise. This includes people who are searching for terms that your recorded content might be relevant to. If you care about SEO and ranking in search, you should always use transcription services to make audio content easily searchable. Did you speak at a conference? Host a webinar? Think about transforming your session into a blog post with an interactive transcript that is easy to share. This not only helps spread your ideas but also ensures accuracy through consistent messaging to your audience, positioning you as a thought leader in your industry. Did you record a new podcast episode? Not everyone has the time to listen to an hour-long segment. Offer your listeners an alternative and break the key points of the episode down into a CliffsNotes-style infographic. After conducting a customer interview, order a transcript and use the best quotes or takeaways from that conversation to help you find a fresh take on how to write emails tailored to other customers in that industry. Does your company hold regular training sessions? Make a recording of those sessions, including the frequently asked questions. Get that recording transcribed, formatted, and send it out to your coworkers as a resource and reminder of training policies. Make it easy for your listeners to share your ideas by incorporating opportunities for tweetable quotes throughout your content. It’s not likely that someone will take the time to accurately type out a quote from your recordings. However, it is likely that they will copy and paste a quote that they see in a transcript to twitter to share with their followers. As more people find your content, it follows that more people will share it, too. This is an obvious but important one. As we mentioned above, it’s very unlikely that people will take the time to transcribe the insights from your recordings and share them out with their followers. Even worse, by not offering your listeners a correct transcript of your audio, you run the risk of them misquoting you. Don’t let the reach of your recordings stop with the platform they are published on. Instead, improve your social engagement insurance policy and back all of your audio up with proper transcripts. It’s not only good for you and your influence but also your audience. When it comes to publishing content online, it’s important to cater to your audience. 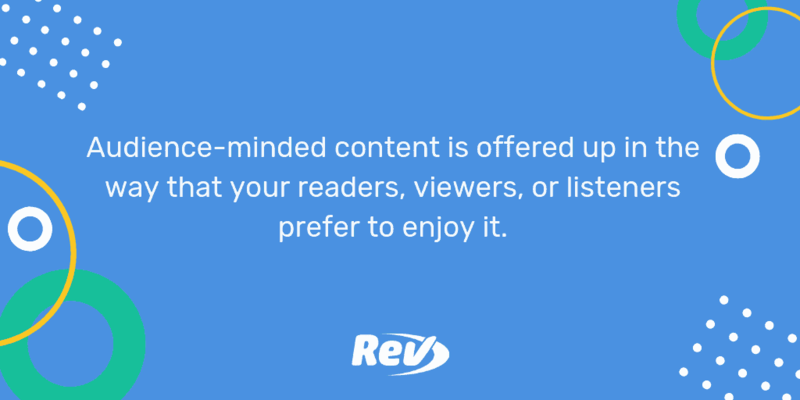 Audience-minded content is offered up in the way that your readers, viewers, or listeners prefer to enjoy it. By offering more than one way to consume your content, your readers can opt to listen on a run or read at their desk. The point is, the choice is theirs and regardless of what they decide, your content should be available to consume either way. There’s no better way to delight your audience than by giving them options. In a world where we expect the freedom to tune into what we want, when we want, on our own terms, you ensure that your content stays relevant by letting your fans make that call. What About the Cost to Transcribe Audio to Text? When it comes to audio transcription, you really have three options. One, hire a professional transcriptionist to do it for you. Two, use an automatic speech to text transcription service. Or three, do it yourself. Which of these options is right for you? That depends on factors like your how much time you have and your budget. However, what’s not an option is posting audio without transcripts to back it up. Here’s our take on each of the options to transcribe audio to text listed above. Cost: $1 per minute. Professional human transcription services, like ours, guarantee 99% accuracy and turn your audio into text in 12 hours. Cost: 10 cents per audio minute. Automatic transcription services are fast, but not always accurate. You’ll have your transcript back in 8-10 minutes, but it will need to be cleaned up to ensure accuracy. For automatic services, accuracy depends heavily on audio quality. Cost: Your time. It takes the average person 4 hours to accurately transcribe one hour of audio. Accessibility, search, thought leadership, your audience — if all of the reasons above were not enough to convince you how important it is to transcribe audio to text, we ask you this: Why spend time creating content, if you aren’t going to maximize its reach? When you’re ready to make the most of your audio, we’ll be here to help you transcribe it. We’d also like to offer you a coupon to try our services out for free. Just click here or fill out the form below and our transcription support experts will be in touch.